The Car Warehouse is a used car and van dealer in Hayes stocking a wide range of second hand cars and vans at great prices. Visit us today for affordable used cars and vans in Middlesex. 1 review has been written for Carwarehouseonline.co.uk yet. The web server with the IP-address 185.53.179.29 used by Carwarehouseonline.co.uk is run by Team Internet AG and is located in Germany. There are many websites run by this web server. The operator uses this server for many hosting clients. In total there are at least 7,327 websites on this server. The language of these websites is mostly german. Only a few websites on this web server are x-rated. 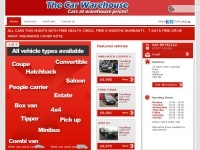 The websites of Carwarehouseonline.co.uk are served by a Nginx server. The HTML pages were created with the latest standard HTML 5. The website does not specify details about the inclusion of its content in search engines. For this reason the content will be included by search engines.